← 72. Crieff Dornock. 2nd Nov 2017. St Boswells golf course is delightfully laid out on the bank of the River Tweed, which is classed a “lateral water hazard”, in the village of the same name just off the A68 1 mile south of Newtown St Boswells in the Scottish Borders. It is so close to the river that it might be appropriate to have a local rule forbidding the shouting of “fore”, which must on occasion disturb the many salmon fishermen on the river. 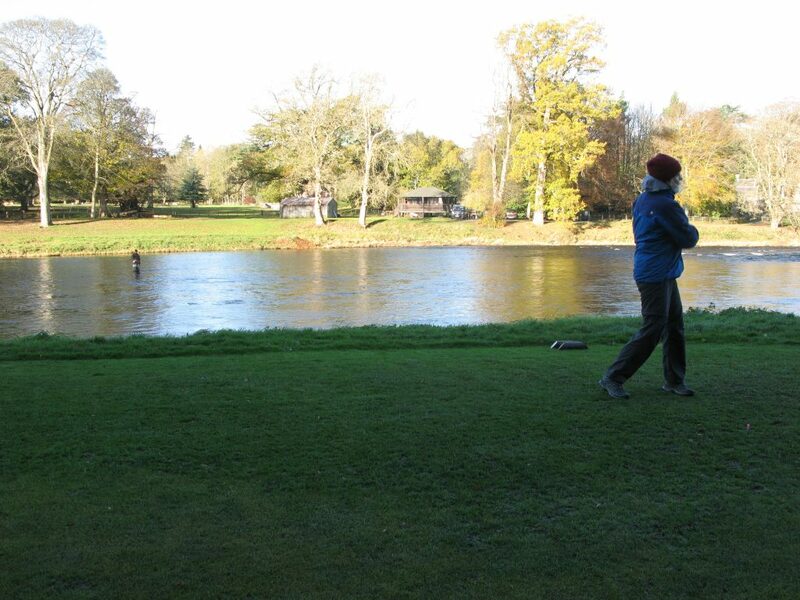 My playing partner Fran drives at the 3rd at St Boswells with the fisherman in the background a common sight on the Tweed. The course was initially laid out by Open Champion William Park, who wrote ‘the turf resembles that found on seaside courses’. Indeed, the course does have a slight heathland feel to the surroundings. The 9th at St Boswells., a short par 4 of 256 yards to finish. 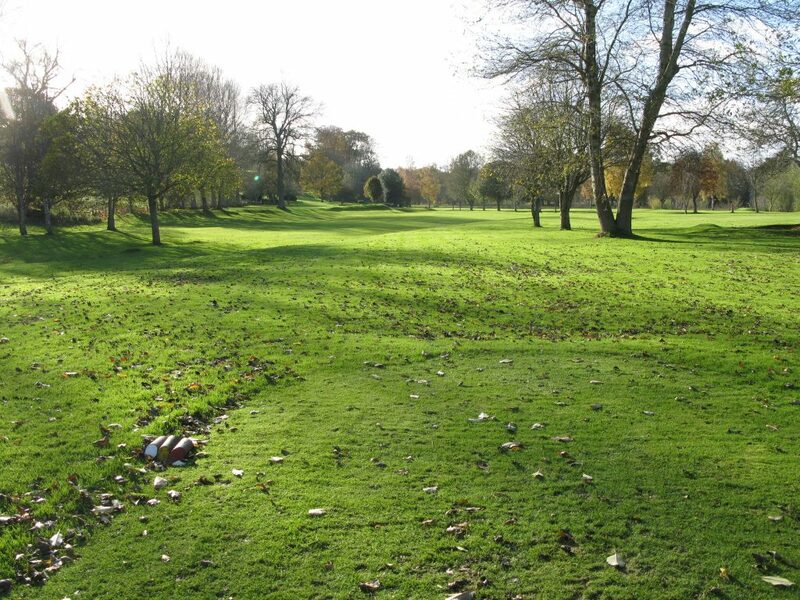 The course was in fact abandoned for 10 years between 1948 – 1958 due to a major river flood, and I couldn’t find out in what way the new layout the differs from the original Willie Park design. Other than the slight uphill par 3 first hole, followed by the significant drop down to the signature par 3 second green, the course is very flat, unlike many of the courses in the Borders. The signature 161 yard par 3 second hole, with the beautiful Borders countryside in the background. This makes for an easy and most picturesque walk for holes 3 through 9. 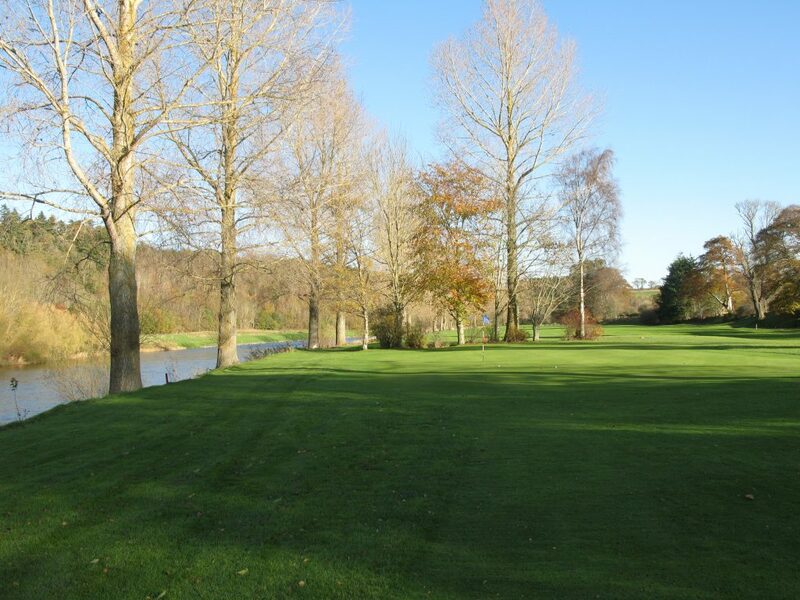 The course is very favourable to a slicer of the ball, with the river tight along the left for holes 3 to 6, with trees lining the left for the return to the clubhouse from 7 to 9. The greens were in good condition, albeit they are quite flat other than the 7th, a short par 5 hole, with a basin or saddle type green. The 5th green at St Boswells with River Tweed awaiting! The course was very soft when we played despite the high wind on the day, which meant plenty cleaning of muddy balls. Overall the course had held up well to the recent weather with all greens still in play. We only paid £5 for 9 holes, but the £15 summer green fee for 9 holes represents good value especially given the beautiful surroundings. I had a fairly difficult day due to high winds, scoring 50 for only 12 stableford points – including 4 single putts (at 4, 7 and 9)! 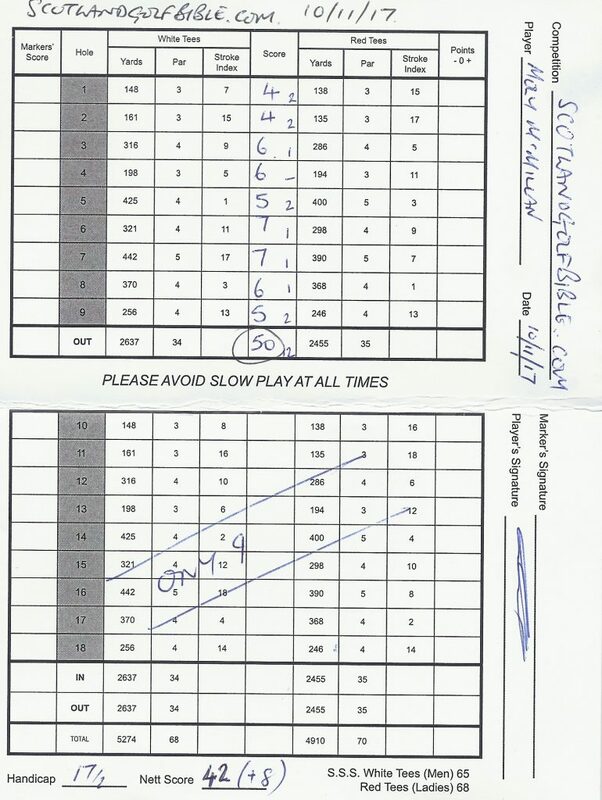 Moly’s St Boswells scorecard – 50 for 12 points! 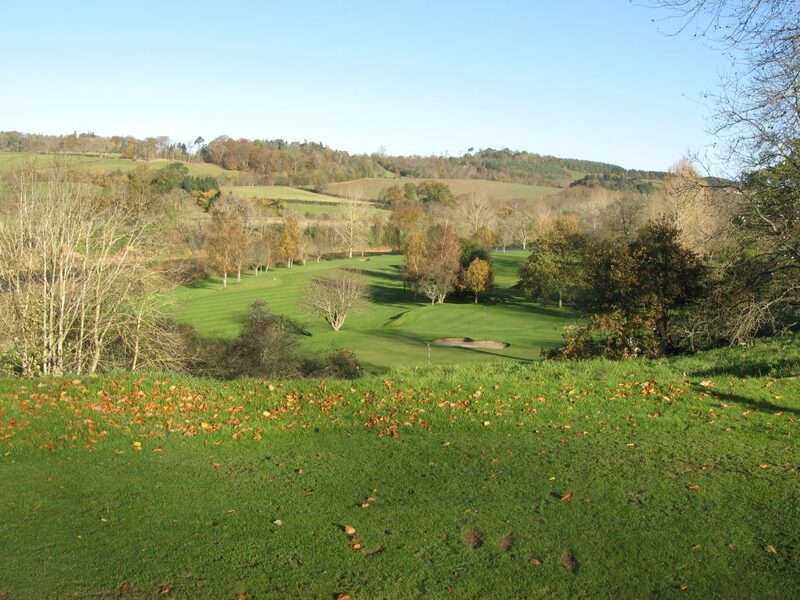 This entry was posted in 1851 - 1900, 3 star, 3.5 star, 9 holes, Course Architech, Course Owned By, Course Quality, Course Type, Holes, Members, Overall Value, Parkland, Price, Region, The Scottish Borders, under £20, When Course Established, Willie Park. Bookmark the permalink.